Iliotibial Band Syndrome (ITBS) is one of the most common injuries seen in runners. It causes lateral knee pain on the outer side of the knee, which can radiate up the thigh. Iliotibial Band syndrome is a common cause of running knee pain, frequently affecting long distance runners and can be notoriously difficult to treat. This condition is also known as Iliotibial Friction Syndrome, ITB syndrome or ITBS and is often misdiagnosed as Runners Knee. The Iliotibial Band (ITB) is often mistaken for a muscle but it is actually a thick band of fibrous tissue that runs down the outside of your leg from your pelvis to your knee. It has a different structure to muscles, making it less mobile and harder to stretch. Some of the buttock and hip muscles attach to it, and the ITB co-ordinates how these muscles work as well as stabilising the knee and leg. Here we will look at the typical causes and symptoms of ITBS, the best treatment options, and and how to reduce the chances of developing ITBS. So what is Iliotibial band syndrome? Iliotibial Band Syndrome develops when the ITB gets irritated and inflamed due to friction. This most commonly occurs at the bottom of the band where it inserts on the outer side of the knee. As the leg bends and straightens, the ITB glides over a bony lump on the side of the knee that sticks out slightly, called the lateral epicondyle. A bursa (small fluid filled sac) sits between the ITB and the bone to allow smooth, gliding movements, but if there is too much friction, the Iliotibial Band gets irritated. When it is irritated, friction from walking and running can cause inflammation and pain to develop. Inflammation of the ITB usually occurs from overuse and is most commonly seen in runners, especially those who do long distance running. 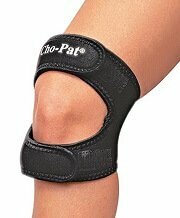 1)	Lateral Knee Pain: pain over the outer side of the knee, especially when the heel strikes the floor. The pain is worse with running and stairs, especially when going down. It may also hurt to bend and straighten the knee. 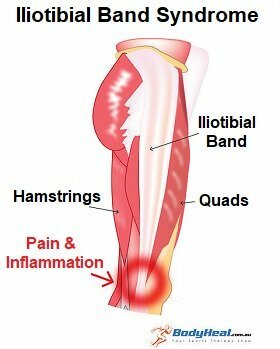 As with any overuse injury, it is really important to work out what caused the Iliotibial band to become inflamed in the first place. A physical therapist/sports injury specialist should be able to assess this for you. It can take several weeks/months to recover fully from Iliotibial Band Syndrome. It is important to give the ITB time to heal so aggravating activities should be avoided. It’s not that you would cause major damage if you kept training, but you will significantly slow down your recovery. This is one of those times when the mantra “No pain, no gain” does NOT apply! Visit the Rest it Right section for guidance on the how to rest, but remember in this case, if an activity hurts, stop doing it! If your symptoms are aggravated by running, you might find that switching to activities like swimming or cycling allow you to keep exercising without aggravating the Iliotibial Band. The best place to start is with ITB stretches, but should not be done in isolation. Stretching the quads, hamstrings and calf muscles also helps reduce the friction at the knee. Surgery for ITBS is extremely rare and is only considered if all other treatments have failed. It is done arthroscopically (keyhole surgery) and aims to break down any scarring in the tissues and if necessary lengthen the Iliotibial band to reduce the friction at the knee. 1)	Warm up and cool down properly: including stretching. Visit the stretching section for guidance on how to stretch effectively: most people don’t stretch properly. 4)	Avoid training errors: such as avoiding running in the same direction on banked surfaces and slowly increasing distances. There are a number of other causes of lateral knee pain as well as Iliotibial Band syndrome. If this doesn’t sound quite like your problem, visit the knee pain diagnosis section for help working out what is wrong with your leg.